Jeffrey Winner is an actor who appeared in the classic 1976 teen exploitation horror Massacre at Central High. In addition, he has been seen in numerous television series including The Waltons, Hart to Hart, Quincy M.E., Married with Children and The Nanny, as well as the big screen mega-hit Forrest Gump (1994). Winner recently completed a run of Neil Simon's play Rumors in Los Angeles. I have loved horror films for as long as I can remember. Like many kids of the Baby Boomer generation, I was raised on such movies of the 50's as The Thing from Another World, Godzilla and Tarantula among others. But, the films that I loved the most were the Roger Corman/Vincent Price/Edgar Allan Poe adaptations in the 1960s, beginning with The Fall of the House of Usher (1960). 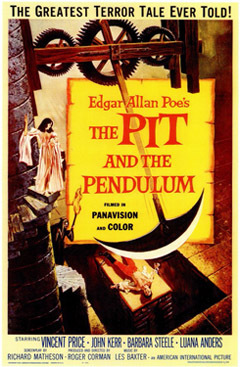 The best of the series, however (and that's saying a lot), is The Pit and the Pendulum released in 1961. With a script by horror master Richard Matheson, a wonderful portrayal of increasing madness by Vincent Price, and a bone-chilling performance by the Queen of Horror, Barbara Steele, this stylish, imaginative film haunted me for days. Unlike most horror films today, the accent in this picture is on the psychological rather than on spurting blood and body parts. Considering its limited budget, the film is a visual treasure: rich cinematography, a spooky castle, cobwebs, candles, and the pit itself which remains very unsettling even fifty years later. Corman takes his time building the suspense, which culminates in a pulse-pounding climax in the final twenty minutes. Just when I thought the film was over, I was hit with a very nasty twist in the last shot which made me jump. 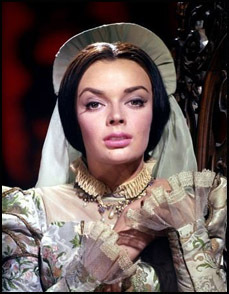 I was just recovering from the year before when I had watched a spiked mask being driven into Barbara Steele's face in Mario Bava's Black Sunday. How much was a twelve year old supposed to take? Most importantly, The Pit and the Pendulum inspired me to grab my parents' volume of the complete works of Poe and devour it from cover to cover. I still read his stories from time to time. By the way, it is my pleasure to inform everyone that Ms. Steele, who will turn 74 on December 19th, is still active. Her latest film, The Butterfly Room is in post-production, and she recently attended a convention in Texas to meet her fans.